June 2014, two men struggled to get Mark into our friends convertible, but it was a great ride and memory now. I still miss the way things were in my before cabinet and enjoy reflecting on the files contained there. I have to smile at the possibility of my mind embellishing those twelve years of memories, because most of the files hold an easier and happier way of life. Anniversaries have a way of making me reflect. Because it will be twenty-five years in just a few days, I realize my married life after the accident cabinet holds more than double the files of my before cabinet. To lift my spirit I’ve set my sights on writing about the positive aspects contained in my after cabinet, which I consider blessings. I’m glad Mark and I survived the accident which could have taken both of our lives. I’m grateful our children weren’t with us when it happened. At the young ages of seven and eight, they appeared to be more resilient and accepting of our new lifestyle than they might have been if they were teenagers at the time. Their childlike belief that all would be well kept us working towards their expectations. I’m thankful the accident happened before we moved instead of after. I’m grateful for the advice and insight of others to stop the sale of our home. This unfamiliar road would have been so much harder had we been attempting to get settled in a new house while seeking new friendships. I appreciate the love and support we felt from our Sandy neighborhood. The benefits of Mark returning home to a familiar place surrounded by familiar people proved to be immeasurable, especially with his short-term memory problem. There are unexpected advantages to Mark’s memory issues, such as not recalling the pain and length of time in rehabilitation. I believe his poor short-term memory has saved him from depression. He is fun to be with and works hard to accomplish things which used to come easy. His example of patience, endurance and the constant expression of appreciation encourage me to do and be better. We’re fortunate Mark regained consciousness after three months of being comatose and remembered the most valuable things in life—faith, family and friends. He retains his determination and quick-wit. He enjoys making people laugh and reminds me that bringing happiness to others brings joy to oneself. He teaches me what’s most important in life and encourages me not to worry about all the other stuff. I appreciate of the wonderful people we’ve met since our accident and their positive examples. They are mentors who give me strength, courage and faith that I can succeed in my caregiving journey. I’m grateful for all those who have shared a part of their stories as guest authors on Uniting Caregivers. We’re happy to live in a wheelchair accessible home which provides comfort and conveniences, making our life easier. We’re fortunate to share our home with my parents who are willing to help in every way they can. We’re lucky to have friends who love and encourage us. Friends who made our move to Draper easier. They welcomed and helped us feel comfortable right from the start. We moved just five years after the accident and we were still adjusting to a new way of life. Their warm reception and support made our new pathway bright. I’m privileged to have parents and siblings who are generous with love and service. We’re blessed they live close by and we can call on them at any time. If possible and needed, we know they’d come at a moment’s notice to assist in any way they could. I’m fortunate to have the acceptance and love of Mark’s family and although they live in other states, we know of their concern and care for us. I’m thankful for cell phones, email and social media, which bridges the distance and keeps us connected. I’m blessed to be a part of a large extended family where cousins, aunts, uncles, nieces and nephews are involved in our lives. We cherish our relationship with each one and I’m grateful for their love and loyalty to family. Looking at all these files of blessings, I realize our life has turned out just as it should for our own personal growth. Our journey may have taken an unthinkable turn on April 27,1991—one I wouldn’t have chosen, nor expected or could have prepared for. However, joy is found in the after the accident cabinet. I believe happiness can be now and forever because Mark is a part of me and I will always be with him. Facing another total hip replacement makes me so anxious and worried you’d think I was the one going through the surgery. I’m confident it would be easier for me than Mark to recover, so if I could I’d trade him places, but sadly it’s not possible. Fortunately for Mark, he remembers very little about the first operation and rehab. A poor short-term memory is the result of his traumatic brain injury and is a benefit in this case. It appears the surgery is not a big deal to him and maybe that’s a blessing for me also. I only need to deal with my own anxiety and not Mark’s too. However, I just may worry enough for both of us. This journey began a year ago and to begin with we said, “no way,” but as the pain and stiffness grew and dressing and transferring Mark became harder, we started to consider the idea. I feared my ability to care for Mark was coming too quickly to an end with already needing a large hernia repaired. We discussed: Where do we go from here? Could we live happily apart? Who could take good of care of him and would I be satisfied with them? Mark wasn’t a perfect candidate for total hip replacements, so he had several tests preformed to determine whether it was even a possibility. Every test revealed a new problem such as severe degenerative disc disease, osteoporosis and scoliosis of the spine and osteopenia (a precursor to osteoporosis) of the hips. These health issues are related to nearly twenty-five years in a wheelchair with limited mobility. Since his hips no longer had the ability to bend at 90 degrees, he spent hours in a poor sitting position, which resulted in terrible neck and back pain. Our bodies are meant to move and if we can’t or don’t, it causes additional problems. The hip replacements became our hope for relief from pain and improved movement in his hips to help with dressing and transferring. However, the test results were discouraging and overwhelming. The bone density test revealed he was a high risk for a break, which is frightful. What should we do and when do we give up? These two questions took months to answer. “Well I’m not afraid of hard,” Mark said as I thought, he’s rather accustomed to it. He lives with hard every day, which makes Mark stronger than he appears. In May I had my hernia repaired and two months later Mark had his right hip replaced. August and September he stayed in a rehab center and has had outpatient therapy twice a week for the past four months. Oh, what a year it’s been and we now understand a new level of hard. Not that we regret the surgery, but we didn’t realize just how long and hard the recovery would be. Mark’s continuing optimism and determination for improvement is inspiring and one of the reasons why I love and support him so much. We knew with the first surgery he wouldn’t get full benefit of it until he had the second one. I’ve dreaded this second surgery day and wished I could take him far away to a place unknown to earth where there are no limitations and only comfort is felt. If we could fly we’d surely escape, but instead we are here with the surgery date just around the corner. With family, friends, a skilled surgeon and therapists, we are confident he will come out on the winning end and hope it will be sooner rather than later. I’m looking forward to Wednesday, post-surgery day. A week from now we should be in a rehab center healing and working on learning how to make that new hip work. As a wife, caregiver and advocate, I’ll be there every step of the way. Not because I have to, but because I want to be by his side. I know from experience he does better, just as we all benefit in any endeavor with support and encouragement from loved ones. So if you’re reading this, you must care and we appreciate you for that. We are grateful for every supporter and welcome every prayer for a speedy recovery. We are better prepared and understand what to expect this time around, so it should be much easier. Besides, now he has one good hip to recover on. Christmas can be a magical time, when wishes become a reality. This was definitely the case for our family in 1991. Mark literally slept in a coma through Mother’s Day, Memorial Day and Father’s Day. He missed out on additional celebrations such as my birthday and our twelve year wedding anniversary. Although he was awake for Independence and Labor Day, Halloween and Thanksgiving, all those holidays were spent in the hospital. After eight months, our wish was for Mark to be home for Christmas. Top: Left – Don breaking ground. 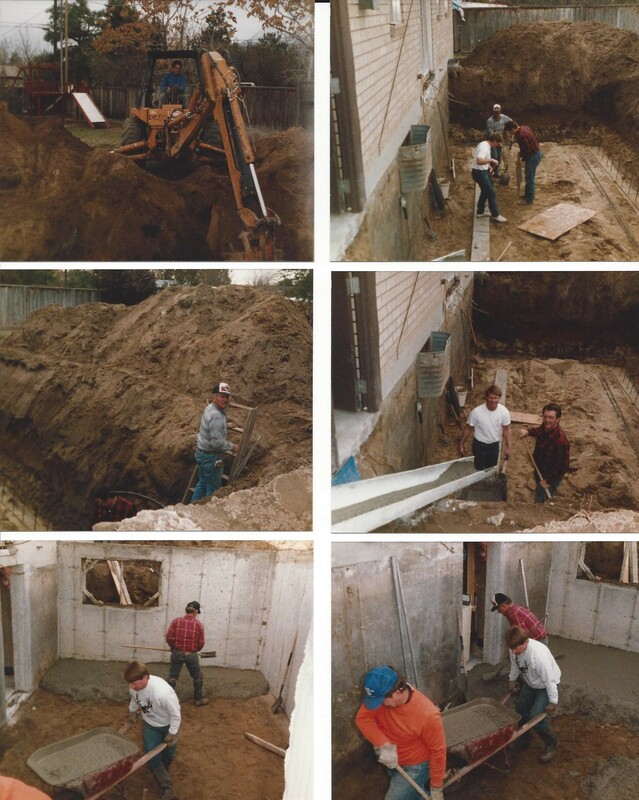 Right – Steve, Mick, Dad preparing for footings. Middle: Left- Dad trying to escape. Right – Steve and Mick pouring the footings. Bottom: Left – Steve and Dad w/cement floor. Right – Mick, Steve and Dad w/cement floor. Mark was far from better and still needed extensive therapy and care, so I worked on establishing a “day- patient” schedule where he’d be at Western Rehab all day for therapy and I’d be able to take him home to care for him every night. At the time he wasn’t able to feed himself or take care of any personal needs. Mark’s doctor, Joseph Vickroy, and the rehab team of speech, occupational and physical therapists, suggested that I spend several nights in an apartment-like room located in the center unit where Mark had been for six months. They felt it was important for me to understand the responsibility of caring for Mark before they released him. I thought the request was trivial since I had spent every day with him and fed him most meals anyway; however, I understood their concern and agreed to do it. I spent several nights there and took complete responsibility for him. Our two children also spent a few nights there to understand what life would be like to have Dad at home. Our living quarters were especially cramped and difficult with the construction going on. The sounds of saws and hammers could be heard until late hours into the night, but with the excitement of having Mark home we hardly noticed. I am filled with gratitude for my dad and brothers who worked tirelessly to make our home fit our needs for our new circumstances. Top: Left and Right – Don knocking out the brick wall into the new addition. 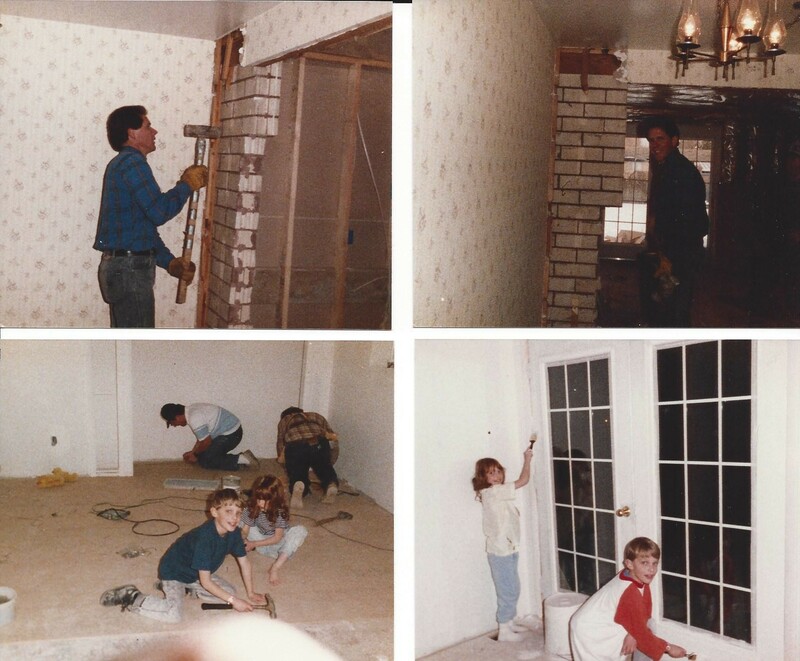 Bottom: Left – Chris, Katie, Dad and Mick nailing the top floor down. Right – Chris and Katie painting our the new room. Chris Chipping, a friend and former employer of Mark’s, did the electrical wiring for our new addition while another friend, Walt Fisher, did the plumbing. It was a crazy, busy and noisy home with construction going on for five months until the addition was completed. 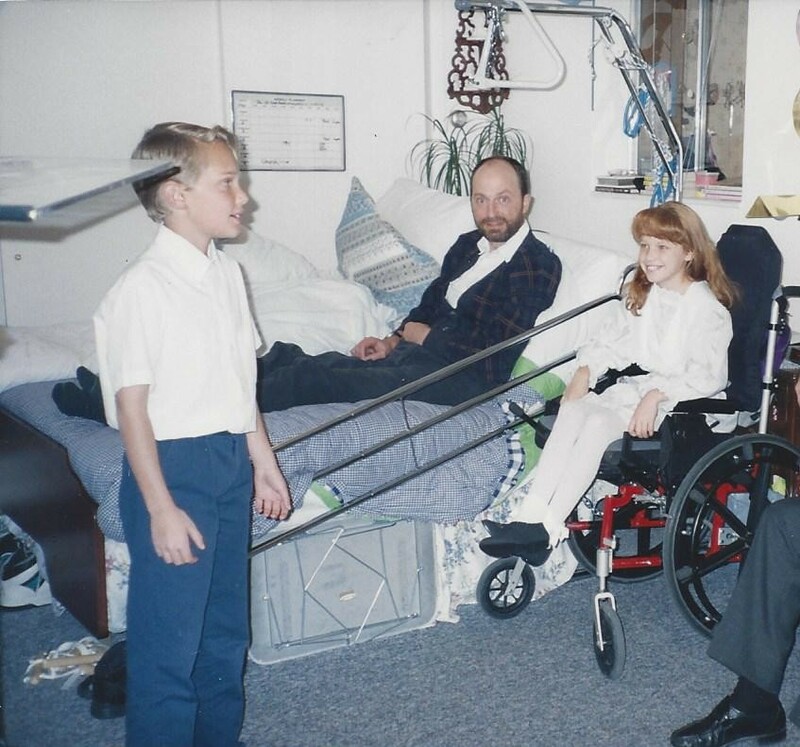 However, the acts of service and love from family and friends made the Christmas of 1991 unforgettable. Our world was turned upside down that year and after eight months of living in a hospital — it truly was the merriest of Christmases to have Mark finally home. Finished room in March. Christopher, Mark and Katie. Our trials were lightened and my caregiving responsibilities were made easier once the new bedroom and bathroom were completed. We were blessed by many skilled hands and a lot of hard work who were definitely making our Christmas wish come true. While we busy ourselves with decorating our homes, attend delightful Christmas programs and parties, shop for the perfect gift for our loved ones, send cards or newsletters, hopefully we don’t lose the joy of the season. Some days our life is filled with wonder as to where to start with all there is to do. It can become overwhelming and discouraging. For other people it’s a very lonely time. This month also means the year is coming to an end. My work load increases with year-end reports and preparations for the New Year. I’m constantly reflecting on the past eleven months and speculating how to improve circumstances and our situation for 2016. This year has definitely been one for the books in all aspects of my life, both personal and business. As I reflect on this year which started out anticipating improved health for both Mark and I. My hernia was getting harder to ignore and since I’d had it for several years the doctor told me I was at risk of it strangulating, which would cut off the blood supply to my intestine and could be life-threatening. In May it was successfully repaired without complications. The best part of my recovery was our daughter, Katie, and her husband, Eldin, stayed with us for five weeks since I wasn’t allowed to lift Mark in and out of his wheelchair. Katie became our main caregiver and she did a marvelous job. We enjoyed having them here. Mark’s painful hips could no longer bend at ninety degrees, causing him to sit in his wheelchair incorrectly, which caused back and neck problems. Twenty-two years ago he had both hip joints scraped clean and we thought it was time to get that done again. After an x-ray, the doctor informed us he wouldn’t be able to do that type of surgery again and instead the hips would need to be replaced. We got a second opinion and were told the same thing. More testing was done because Mark isn’t a good candidate for a total hip replacement. He has the early stages of osteoporosis and there was a worry of a break or easy dislocation. We were told his limited mobility would make it hard to heal. We debated back and forth whether he should have the surgery or not. Transferring Mark in and out of the wheelchair was getting harder due to his inability to bend forward at the hip. It’s hard for us to comprehend that there may come a day when I’m not physically capable of taking care of Mark at home without lifts and other equipment to fill our house, but that reality was now staring at us. We were warned and understood the surgery and recovery would be hard, but we’ve done “difficult” many times so we were confident we could handle it. Mark had his left hip replaced in July. We lived in a rehab care facility through September. Since we’ve been home I’ve taken Mark nearly every day to outpatient therapy. The surgery went well, but the recovery has been beyond what we could imagine. Mark has endured more discomfort and pain from therapy than I thought possible. He’s a man with true grit and has overcome a more advanced level of difficulty. Despite the anxiety of surgeries this year, we have received many blessings. We were able to stay in a nice suite at the care center, which included a bedroom and bath with a roll in shower for Mark separate from a full kitchen and living room. I was able to take my computer there and continue to work from our temporary home. The furnished suite even had a beautiful view of our familiar mountains, which always brought me comfort during our new circumstances. Mark has had excellent therapists who have become dear friends over the past several months. We are establishing a larger support group to help Mark continue the needed daily exercises even when the “official” therapy ends. These assistants are being trained by a certified therapist. I am so grateful for each person who is on Mark’s team. I appreciate the increased love and care we feel as we have built many new relationships this year through therapy and patients. I’m so fortunate to have a flexible job, which allows me to work from home at all hours giving me the time I need to take Mark to needed doctor appointments, tests and therapy. I have two compassionate and understanding employers whom I love and appreciate. 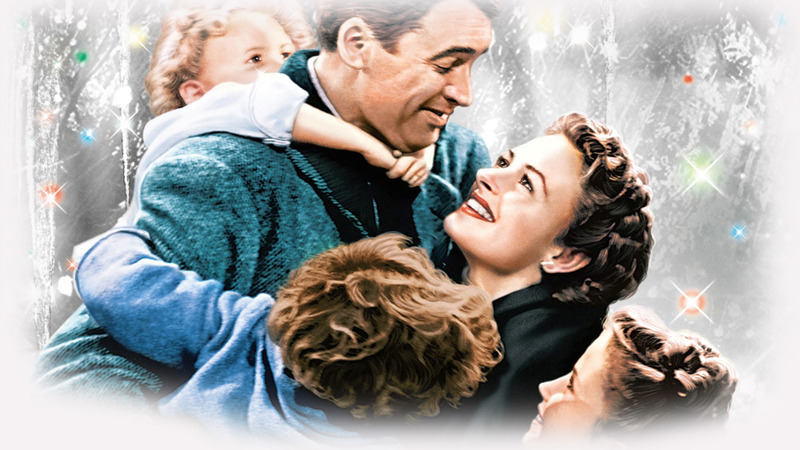 It is truly a wonderful life. Not the one I’d envisioned, but I’m grateful for all the good that has come with it. As we celebrate Christmas and hopefully feel the love this season brings, may you take time to see the good you’ve brought into the lives you’ve touched. 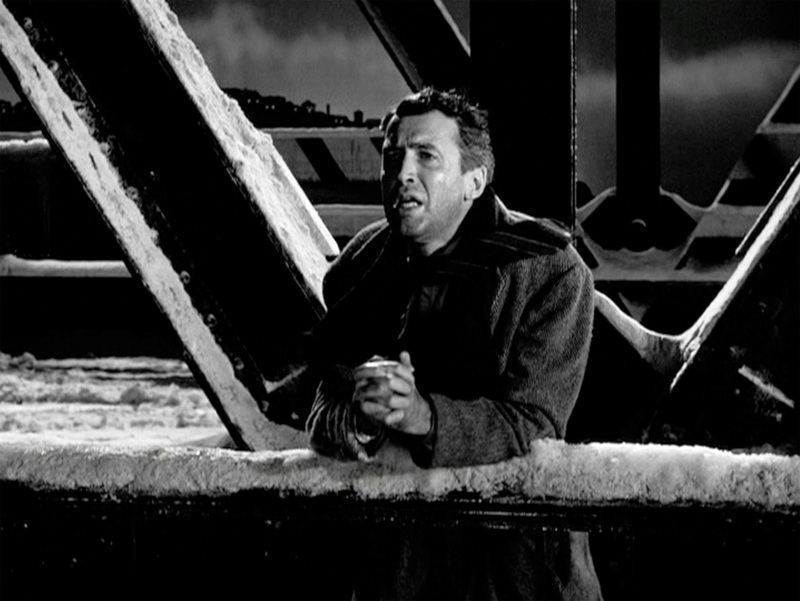 It’s not an easy thing to do and for George Bailey it took an angel to help him realize the impact his life had on others. My holiday wish is that you too can see the good in your wonder-filled life and realize just how wonderful it is. If it’s too hard to do, call on an angel to help. I’ve heard some are eager to earn their wings. My day has been filled with gratitude for all I have. I am thankful for life and realize every day is a bonus day and should not be taken for granted. I appreciate the education of doctors, nurses and therapists who have developed the skills to help heal and improve our health issues. I’m grateful for the hard work and progress Mark has made through his hip surgery and therapy. I’m grateful for our comfortable, wheelchair accessible home, which always gives me something to fix up or improve and the space I need to be able to work at home. I appreciate my employment in property management which enables me to pay for all the necessary things in life. I am fortunate to have wonderful bosses and friends such as Steve and Rick. I appreciate all they do for me in our business as well as my personal life. I am also blessed to live with Mom and Dad. I am grateful for their continued love and support and I’m thankful we can help each other in all things by living together. I appreciate my children, siblings, nieces, nephews, cousins, aunts and uncles, who I know I can count on for help at any time or in any situation. They are the foundation for everything we accomplish along with the love and support of neighbors and friends. Many people volunteer their precious time to help us. We are blessed by many people—family, friends and neighbors who love and give service to us. My need to give back is the driving force for writing our story and developing Uniting Caregivers. This passion has brought new friendships through writing and caregiver’s support groups, along with readers and participators of this blog. I have learned so much and have gained from their experiences. I am grateful for the influence of other writers and their encouragement in my own writing endeavors. If you are reading this, I am grateful for you! I appreciate your feedback, whether it’s done with words or the click on the Like button. I hope what is written has helped you find hope and encouragement in your trials. I have truly been blessed in my life’s journey and writing about our experiences manifests those blessings to me. A perfect picture of Thanksgiving is sitting at my parent’s large dining room table, beautifully decorated with an autumn tablecloth, centerpiece, nice plates, glasses and silverware, surrounded by wonderful family and friends. I was in this type of scene a few nights ago, however it wasn’t a Thanksgiving dinner, but rather a birthday celebration. My mother still enjoys gathering her five children and their spouses home for a feast three or four times a year to celebrate birthdays. Lots of laughter is heard while we enjoy each other’s company. This is a happy table, yet I came to it feeling overwhelmed and discouraged. I tried to mask the weight of my daily tasks and worries about Mark’s health. When the conversation turned to past vacations my siblings had taken and the possibilities of future trips, I forgot all my many blessings and had to leave the table. Instead of feeling joyful for their experiences, distress set in. I was no longer focused on how lucky I am to have all my siblings live close by and both my parents still alive. For a moment, I forgot how fortunate I am for the love and support we all share with one another. Unfortunately my thoughts turned to all the places I’ve never been nor could possibly go to. I wasn’t living in thanksgiving, yet I know I’m happiest when I do. 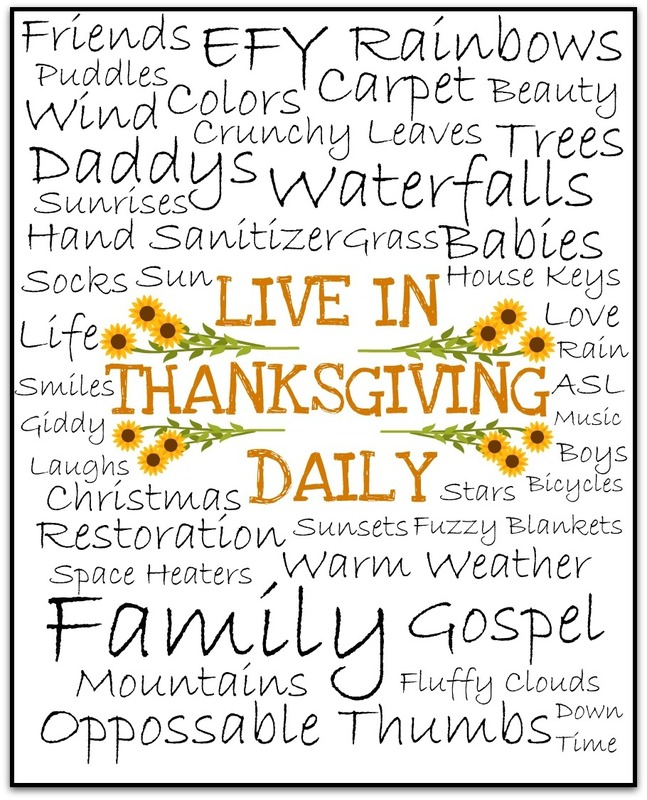 Thanksgiving is more than the annual national holiday which commemorates a harvest festival. It is an expression of gratitude, especially to God. 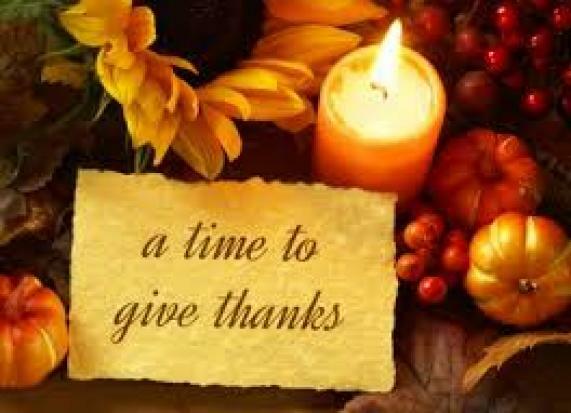 I appreciate this time of year which reminds us the importance of giving thanks, however, every day should be a day of thanksgiving. But it’s hard to give thanks in all things. I’ve learned from Mark that expressing appreciation brings happiness not only to yourself, but those around you. It also lessens stress and anger, which makes you a healthier person. When we focus on our blessings, we see more blessings because our attention has been turned in a positive direction. Recently in one of my writing groups we were given a blank piece of paper to write as many positive characteristics about ourselves in five minutes. The goal was to fill the page. I enjoyed the assignment and kept it to read when I’m feeling low. While organizing some files, I found and read a talk Mark wrote and gave in church, November 1990, five months before our car accident. The title, The Blessing of Adversity, grabbed my attention and my heart started to pound as I read on. By the time I got to the last few paragraphs tears were flowing as I realized twenty-five years later the prophetic nature of his words. The talk is well over 2,ooo words so I decided to publish only part of the talk. I try to keep these articles around 1,000 words. If you didn’t know my husband before the car accident, this gives insight on how he was before and you’ll see the core of his soul hasn’t changed. He is an example of enduring to the end and appreciating life and the lessons learned along the way. Many blessings are obvious. 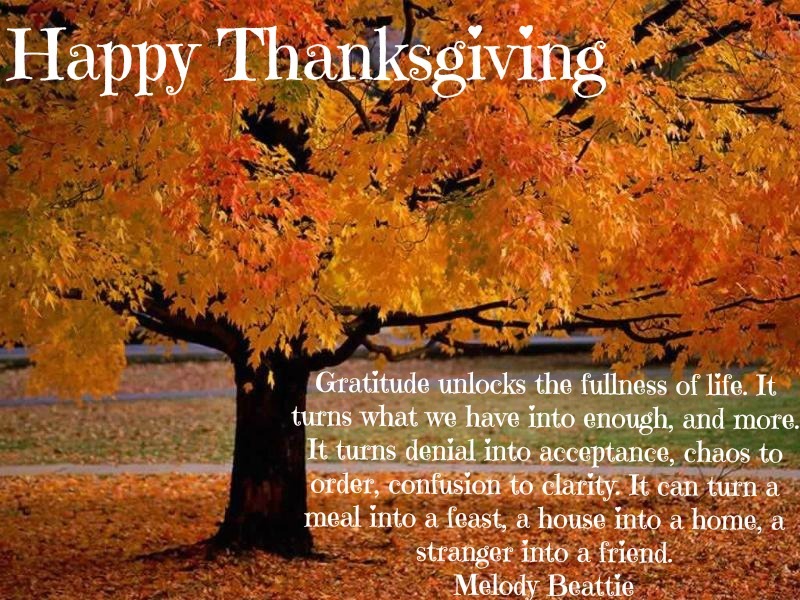 Our families, friends, homes and the country we live in are all blessings most of us recognize and are grateful for. But I’d like to talk about some blessings that aren’t always so obvious. You see, I believe that very few things happen in this world that aren’t blessings, even being asked to talk in church, for instance. Like many of you, I am terrified of talking in public. While serving as ward clerk, I sat in on many a bishopric meeting, wherein the topic of discussion often was “who can we get to speak in sacrament meeting?” You know, not once did I volunteer. Come to think of it, I don’t remember anyone else volunteering either. How can giving a talk in sacrament meeting be a blessing, you ask? Well, if you do it enough, chances are you’ll learn not to be scared. Not being afraid in front of large groups of people would be a plus, I think. You see, what I’m really talking about is adversity, or rather the opportunity to overcome it, can be a blessing. We’ve all been taught this sort of thing before. The scriptures give many examples of how people have been blessed or how we can be blessed by “enduring to the end” or overcoming adversity. In my line of work, I have on a number of occasions had to serve as job foreman, with anywhere from one to a dozen other electricians in my charge. Being a foreman is a job that I’ve never liked. The raise in pay (usually a whole dollar an hour) never seemed to compensate for the added worry over doing the job right, along with the pressure of getting the job done on time. There are always problems with getting the manpower, equipment and materials you need on time. My first experience along these lines was a real disaster. When the first phase of the new minimum security men’s facility at the state prison was built, the company I was working for at that time was contracted to wire it. This involved not only the power and lighting systems, but also some very involved security, communications and life safety systems as well. My boss asked me to be in charge of four of the seven buildings. Up to that time, I had had no prior experience on jobs of that nature. In fact, I was still only an apprentice. I consented and before I knew it, I found myself desperately trying to figure out all these systems that were my responsibility. I was reading from blueprints that were rain-faded and wind-torn because the weather was so bad. The general contractor was literally pouring concrete down our boots as we worked feverishly to stay ahead of them on the conduit work. One conduit left out or plugged with concrete would have spelled big trouble and a great deal of expense to correct. I was so nervous and uptight that I found I couldn’t eat my lunch. I was actually sick to my stomach with worry. I couldn’t sleep at night. I was a nervous wreck. After a few weeks of this, I called my boss one night and told him I couldn’t go on. He would have to find someone else to take my place. He did and I got my sanity back, but I’ve regretted that I didn’t stick with it. What a tremendous growing experience this could have been for me had I been able to “endure to the end”. Several years have passed since that awful prison job and I’ve been in somewhat similar circumstances a few times. Although I haven’t quit, I’ve never really gotten used to being a foreman and I avoid it all together whenever possible. About a month ago, I was called into the office and asked to run a job. I thought, oh brother, here we go again. Next the boss starts telling me how important this job is because we’re looking forward to the people we’re working for to throw us a lot more work in the future if we perform well on this job. That’s all I need, more pressure. One of the reasons I agreed to be the foreman was because he said we had three months to get the job done. Shortly after I arrived on the job site, the general superintendent informed me we had three months to do the job, but that was two months ago. It took the lawyers, owners and engineers the first two months to get the paperwork done. We only have one month left! That day, lunch was a little hard to get down. That one month is over in four more days. There’s a chance we might not finish on time. But whether we make it or not, I feel good because I managed to “endure to the end” and just did the very best that I could. The feeling that gives me is downright terrific. What a blessing trials and tribulations can be! We’ve all had problems at one time or another that we thought at the time were insurmountable. How did we handle it? How about the times that we’ve given up? How does that make us feel? What a difference it makes when we persevere or “endure to the end” and win! Even during the times when we don’t give up and lose anyway, we still learn a valuable lesson. It’s not the end of the world! The sun will still rise the next day. We should thank our Heavenly Father for this wonderful life He’s given us and all the problems that come with it. When we are faced with adversity, we should wipe the frowns from our faces and the tears from our eyes and with appreciation in our hearts for a God that loves us enough to test us to our very limits. With gratitude we should dive right in head first knowing that all things give experience for our good.